Teddy and the Yeti #1 on sale at NDC! I'm hoping to get the book listed on their website, so I can put a link on mine and anyone who wants to buy one will be able to, regardless of your relative distance from Pittsburgh. Regardless, it's good to have another issue of Teddy and the Yeti on the shelves. Only a few more weeks until #2 is released. 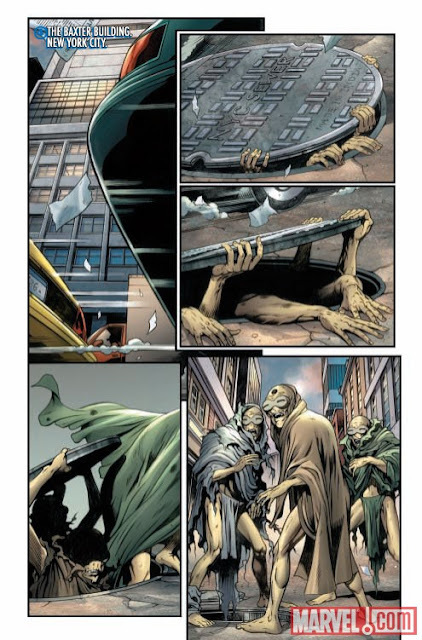 The following is a preview from this month's Fantastic Four #575, featuring the Mole Man and...HOLY CRAP MORE PEOPLE LIFTING UP MANHOLE COVERS AS IF THEY WERE MADE OF PAPER MACHE! Didn't people read my post from a while ago explaining that it's actually really, really difficult? Sigh...apparently not. Manhole covers notwithstanding, I suppose I'm enjoying Jonathan Hickman and Dale Eaglesham's early run on the main Fantastic Four title. It's not exactly reinventing the wheel (and Mr. Fantastic is drawn like he's a professional wrestler), but I'm giving it a chance. One thing that bugs me, though...okay, one thing OTHER than misrepresenting how hard it is to lift up a manhole cover (they weigh hundreds of pounds! If it was easy everyone would steal one and there would be countless accidents with people falling down into open sewers!! 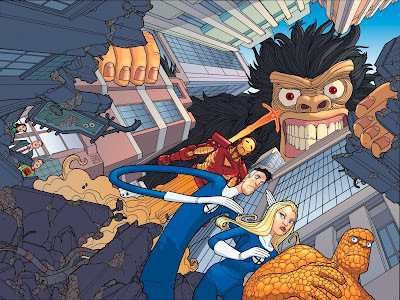 ), I'm a little irked at how Marvel has seemingly forgotten all about the Fantastic Four/Iron Man: Big in Japan miniseries where all of the Moloids (the weird creatures pictured above) formed into a giant spaceship and rocketed away form Earth, leaving the Mole Man sad and lonely. Okay, I'm not saying that this particular plot point made a whole lot of sense, but the fact is that a writer at Marvel wrote it, an editor at Marvel approved it (probably several editors), and it went right through the process for publication. I read it and thought it was crazy, but hey, it is what it is, right? I guess not, because it's been entirely forgotten. It seems that if something of this nature is going to be left behind months after it sees print, then perhaps someone within the company should put a stop to the story (or at least that aspect of the story) before it gets that far. This has happened before, of course, but maybe not as often as it happens to Dr. Doom. There have been several stories where Doom has seen an incredible power upgrade, changed his costume and told the Fantastic Four that they are now beneath his concern, but he'll kill them at a moment's notice if they bother him again. Walter Simonson did a great story around FF #350 dealing with a new, improved Doom (who had apparently been in space or somewhere for a long time previous to the picture below), and Millar and Hitch did it again just a few months ago. 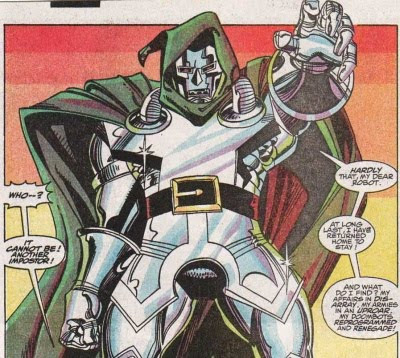 But now even though barely any time has passed since the story was printed, Dr. Doom is back to being his same old self, at his same old power level. It just seems...poorly planned. I sound like a pretty big nerd right now. So I'll stop. But seriously...manhole covers. Come on. 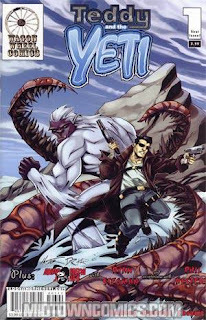 Teddy and the Yeti on Comic Book DB and Collectorz Comic Database! Sometimes it's fun to watch and see other people mentioning Teddy and the Yeti or listing the book on new release forms without any input from me. Other times, dammit, I have to mention it myself. I thought about pretending that I wasn't the one who made the submissions/updates, but what the heck. I hold the smoking gun. Teddy and the Yeti is now listed on the catalogue site Comic Book DB and on the organizing software from the Collectorz company! The Comic Book DB site post thumbnail covers, story synopses, and character and creator information for tons of comics, and now they have listings for issues 1 and 2, along with the New Dimension Comics version of #1. Collectorz picked up on this info and uploaded it to their database, and the cover to issue #1 was used on their page that lists the daily updates for the software for January 27th. They've uploaded the three issues to their own page as well! I've used their database before, and it's pretty sophisticated. It's a handy tool when you're looking to organize a gigantic collection - all you do is enter the title, select the issue number, and all of the other relevant info (even the stuff you really don't need to know) including a cover scan uploads right along with it. I'd probably purchase it myself, but they don't yet have a version that works on a Mac...which causes me to scratch me head, because Macs are awesome. I've also updated the main website a bit, with a preview of issue #2 (including a the first look at the final cover) and a few other minor things. Just a few more weeks until the second issue is out! I'm in the planning stages of putting together a "convention exclusive" edition of Teddy and the Yeti #3, one that I'd sell only - get this - at conventions. Hopefully that includes more than just the Pittsburgh Comic Con, as I have the application for the New York Comic Con filled out and ready to mail. Fingers crossed! Jorge Correra, of Action Comics and Protector fame, put this together for me, featuring a strange party with - gasp! - Teddy and the Yeti and all of the characters from the backup stories that appear in each individual issue. Outside the window is the monster from my as-of-yet unpublished story, "You Don't Mess with the Big Red Rex!" (co-created by Paul Tucker), which would conceivably be the backup story for Teddy and the Yeti issue #4...premature, for sure, but I had to get the character in because I like him so much. I really like this cover, because ist has that "crossover" feel. Even if it's completely misleading and the characters don't interact inside the covers at all. It's been a while since I've posted anything about some of the other comic stuff I've been working on, and now seems a good a time as any. Faith and Charity hasn't seen much movement in quite a while, but it's one of those stories that I always hold out hope for - maybe one day it'll get untangled and see print, one way or the other, because while it's probably one of the more different stories I've ever written, it's also one that I think holds a lot of promise. The story is your basic coming-of-age tale with two sisters - Faith and Charity - and superheroics mixed in for good measure. The two learn that they have inherited special abilities from their mother, and soon their entire lives are turned upside down by the consequences. Plus, their high school principal is totally turned into a rhinoceros, and as anyone who has ever watched an episode of Beast Wars knows, rhinos are completely awesome. The art (and most of the production work you see) is by none other than Mario Wytch, who contributes a great pinup to Teddy and the Yeti #2 (and possibly #3, though that's not certain). I'm not sure if Mario will agree with this or not, but I think that his best work is done on these slice-of-life stories such as Faith and Charity. His distinct, fluid style is great for showing emotions, and Faith and Charity has plenty of that to go around. We'll see what happens with this story - I believe that a first issue was once upon a time completed to the inking stage, so we do have something to go on if these wheels would start turning again. In the meantime, I've written a script titled "The Ferryman" (not the most action packed sounding title, I admit) with Mario in mind - it's a one-issue story involving zombies...in space. 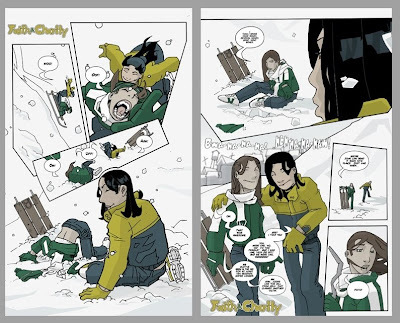 If it pans out, I might be publishing that story after Teddy and the Yeti #3 and before an issue #4, which I'm still hopeful for. Teddy and the Yeti #1 New Dimension Comics exclusive version is here! I had a box waiting for me when I got home yesterday from Comixpress - when I opened it up I found, underneath tons of shredded paper for padding, the New Dimension Comics version of Teddy and the Yeti #1! Check out the tour above. The books look good and the Alan Gallo-Karin Rindevall cover looks great. The interior coloring is just a bit brighter than the regular edition from Brenner, which is good when reading the Andromeda Jones story, though the Yeti has a little bit of a pinkish hue to her in a few panels. In any case, you wouldn't notice a big difference unless you put the two copies side-by-side, which of course I did. The next step is to ship these copies off to New Dimension Comics (I know, why didn't I just have them shipped directly to them? Because I needed to inspect them first. I NEEDED TO! ), where they'll decide just when and how they'll go on sale. I won't be selling any of these directly - hence, the "exclusive" tag - but I'll have a link to the NDC website on my main site. It's great to check this off the "to do" list! This is a bit of a departure from our normal fare, but I wanted to take some time out and announce that my extended family has just grown by one! 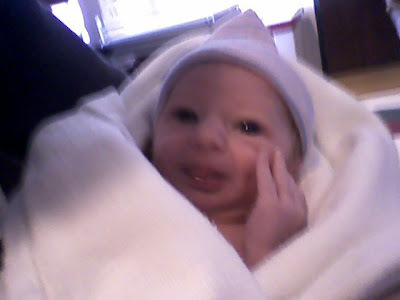 My nephew, Jacob Thomas Quinn was born just a few hours ago and he's ALREADY putting up cell phone pictures of himself. Why, when I was his age, cell phones were so big, they weren't even invented yet! Since this is a comic book blog, you might be asking yourself, "Jeff, isn't the Thing's middle name 'Jacob'?" Why yes, astute reader, it is. Is this little guy named after the Thing? All I can say is that he'll be getting Fantastic Four related gifts from me for the rest of my life. WHETHER HE WANTS THEM OR NOT! The only question that remains is if he'll garner the nickname "The Snake" later in life. It's hard to believe that the town of Brownsville, Pennsylvania was one a bustling center of commerce, one that famously threatened the successful development of nearby Pittsburgh (back before it had the "h"). 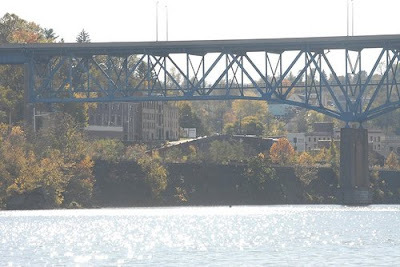 Brownsville was on the fast track to become a destination point along the Monongahela River before its major industry (coal mining) left town for good. Granted, this was decades before I was born, but I still sometimes wonder what could have been if only the old factory workers and miners stayed and collectively decided to develop some new form of progressive industry. Perhaps a wind farm! In any case, Brownsville was once home to the now defunct Brownsville Telegraph newspaper. A friend recently brought back the Telegraph, repurposing it as an online tool for community news and organization. As the Telegraph was kind enough to cover my recent signing at Evil Genius Comics with a string of pictures, I thought it only fair to write an article about Teddy and the Yeti for the site. The fact that the article serves as a nice marketing tool as well is purely coincidental. Somewhere in the process of writing the article, it changed into something of a manifesto, detailing my thoughts on the comic industry and how one might put a comic book together if one were so inclined through a series of hypothetical questions. It ended up being longer than I had anticipated (not an uncommon experience), but overall, I think it reads well. You can read it yourself by clicking here. There's also a separate page devoted to a preview of the book here, complete with comic book-y font and borders. Check it out! Issue #2 went thorough its proofreading stage, some small edits were made (I can't believe I wrote "onto" instead of "on to"...seriously, I should know better), and now the pdf file is off to the printer. It's out of my hands! And that's a great feeling. We're still on schedule for a February release, which is just where I wanted it to be. Most folks got a hold of issue #1 at the December 30th Indy Comic Book Week release, so those people will have to wait even less than the folks who got it when I took it around to stores myself. Issue two, just like the New Dimension Comics exclusive edition of #1, is being printed through Comixpress, a fairly well-known small print run printer. Issue #1 (the one with the Phil Hester cover) was printed through Brenner, and the folks there did a wonderful job; I'm not switching because of any problem I had with them. Their pricing scale, combined with Diamond's suggested minimum print run, is set up more for larger print runs, and that ultimately doesn't fit the numbers for an independent book like Teddy and the Yeti. Now that I'm distributing through Haven (and going door-to-door in some cases), I can be a little more conservative in how many books I print at once. If I run out of books (what a great problem that'd be! Assuming they didn't just get dumped in a lake or something), I can just place another order with them as necessary. ...having a dinosaur on your cover is pure genius. Apparently having a T-Rex chasing down your hero is popular, too. 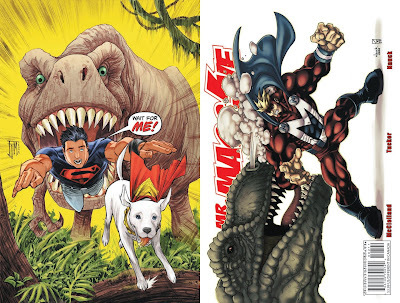 The image on the left is from Adventure Comics #6, on sale yesterday, and the image on the right is Todd Nauck's back cover to Teddy and the Yeti #2, on sale next month. I hope Toyrocket doesn't screw me over. I wrote a while ago about a great sale going on at toyrocket.com, where everything was at least 50% off. Deals on this site seemed too good to be true! And like the old saying goes, when something seems too good to be true, ignore it and spend your money anyway! Wait, maybe it's a little different. 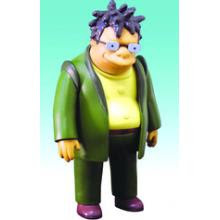 After placing my order at the site, I quickly received the two Thing figures I paid for, but everything else, including two Toynami Futurama sets and a Jerome Bettis McFarlane figure, was marked as either a preorder (Futurama) or backorder (Bettis). Puzzlezoo is not responsible for any order placed and shipped or canceled before 12/23. Please do not contact Puzzle Zoo regarding a Toyrocket order as they have no information at all regarding any Toyrocket customers. If you placed an order before 12/23 it will have either shipped or been canceled/refunded. If you have not received a refund for a canceled order, please contact your credit card company. If you have an order backorder or preorder, this order will remain open for fulfillment by Puzzlezoo.com. Unless you choose to cancel the preorder or backorder, Puzzlezoo.com will still honor and fill those orders as they come in as a service to Toyrocket’s loyal customers. So, all hope is not lost, but I'm feeling pretty antsy, especially since Futurama series 7 AND 8 are out already. My shelf is missing the likes of Mom, Nibbler, Hermes...crap! Puzzle Zoo, you had better get up and running quickly. Because knowledge is power, here's more updates about Teddy and the Yeti that might not merit their own blog. I apparently have standards when it comes to blog length. - Indy Comic Book Week has been good to Teddy and the Yeti, even though I just kind of lucked out and released the book right around the date when Diamond decided to take a week off. The extra spotlight (releasing the issue wasn't enough?!?) led to some reviews, most of which mention the fact that the title rhymes. This is fine, because I think about it daily. "Just a Few Comics" is one such site to take a look at the title. The author postulates that I call the book "Teddy and the Yeti" because "the Yeti's name did not rhyme with 'human'". "Human and the Crewman" was actually my second choice for the title. How did he/she guess? - Project Fanboy named Teddy and the Yeti #1 one of their "hot picks" for the last Wednesday of 2009. Click the link and scroll down to see a tiny thumbnail of issue #1s cover. You might even print it out and stick it with your action figures so they get a chance to flip through it. - I've just heard back from Lone Star Comics, another big online retailer who will soon be carrying and selling copies of Teddy and the Yeti. I've got a package ready to ship to them now, so I imagine they'll have it available soon. Lone Star, which has about a billion stores in the state of Texas, joins Midtown Comics and Mile High Comics as online retailers carrying the book. I'm particularly excited about this because Lone Star has a great back issue selection, and I place big orders with them several times a year to plug holes in my collection. Yes, I will be tempted to order my own book once it's up and online, even though that really serves no purpose. 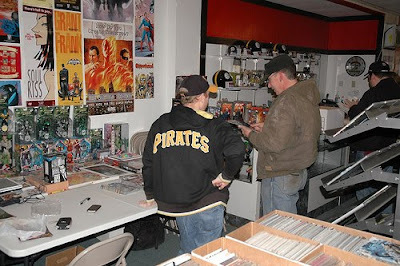 - I've sent in my application for the 2010 Pittsburgh Comicon. The powers that be cashed my check with lightning speed, so I assume that means one of two things: I just got robbed, or Wagon Wheel Comics has a spot at the show. I'll post more about this once I know more! - The New Dimension Comics Exclusive version of issue #1 has been approved for print and should be in my hands within a week. 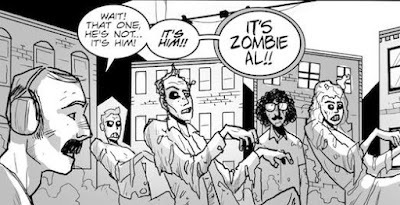 The assembly line keeps moving, as I'll immediately send them issue #2, which I just (as in, half an hour ago) finished lettering. Once it goes through the proofreading process, it'll be officially in the hands of the printer. This is a bit later than I had hoped, but it shouldn't affect the in-store date of the book, which is still February...less than a month from now! - This has nothing to do with comics, but I don't care. I met Jerome Bettis the other day. Did I mention how much I love Jerome Bettis? Well, I do. One of the best running backs of all time, and Mr. Steeler to me! As I was browsing through Evil Genius Comics a few weeks back, the card game seen pictured above caught my eye. Since I was promoting a book that prominently features a Yeti at the time, I stopped and picked this product up to make sure that I wasn't going insane and was actually seeing two Yetis dressed up in Civil War gear. "Yetisburg", as it is called, proves that things that rhyme with "-eti" are supremely marketable (you hear that, Hollywood?!). However, the setting and background of this game do seem to be a little inconsiderate. I'm not one who thinks that everything past is sacred, mind you, but taking the most bloody struggle in U.S. history and reenacting it with rather absurd mythical characters...well, I suppose that worse things have been done, but still. The product description is below. If there's anyone who has actually played this, I'd be interested in hearing how the game holds up. I'm not much into most card games myself, but hey, put a Yeti in it and maybe I'll take notice. On the bloody fields of Pennsylvania in 1863, two great armies collided to decide the fate of a nation. The South rose, and the North responded with fervent mettle. At the forefront of the battle stood the mighty Yetis, white-furred giants imported from the wilds of Canada to shred the opposing front lines. The great generals strode through the battle lines, engineering the destruction of the opposing forces while powerful mastodons hurled bombs into the fray. 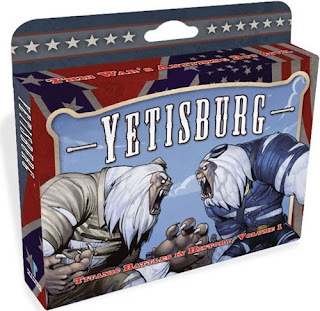 Yetisburg is a fast-paced, two-player card game where the South is pitted against the North in brutal battle. Yetisburg—This War's Anything but Civil. Comic News Insider reviews Teddy and the Yeti! Comic News Insider, the long running comic book and pop culture review show, took the time to do some independent comic reviews a few days ago, and Teddy and the Yeti #1 made their list! It's always satisfying to know that people are actually reading the book, but it's equally satisfying to know that, hundreds of years into the future, an electronic broadcast mentioning me will be saved somewhere as a morbid reminder of my dead, rotting corpse. But maybe that's just the self-serving part of me speaking. CNI broadcasts once a week (more or less every Tuesday); if you go here, you can see a list of episodes - Teddy and the Yeti is part of episode #238. Or, you can simply go here for the direct link, and here for the mp3 download of the show. If you click on the "podcasts" tab on iTunes, you can find it there as well. The reviews of the book can be found right around the 31 minute and 30 second mark of the show, and, honestly, they are a bit mixed. It seems that the hosts' biggest concerns with the book deal with the flashback scenes and how they relate to the overall flow of the story. I can certainly accept this criticism; I was going for an in media res approach to things, and I suppose that works for some better than others. Hosts Joe and Jimmy also spend a good deal of time talking about how much they like the title of the book. This may seem surface-level to some, but MAN! I love the title, too, so it's all right. Everyone loves a good rhyme, and when your title includes the word "Yeti" in that rhyme, only good things can follow. I enjoyed listening to this show and the review a lot - to have someone discuss your work is a humbling experience. Obviously, I wish the review would have been more positive, but that's what you set yourself up for if you put work out into the public arena. And there were some good things said, too. 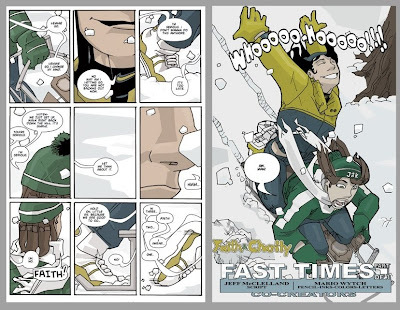 Maybe I'll send them a copy of the fast-approaching issue #2 and see if they mention the book again! 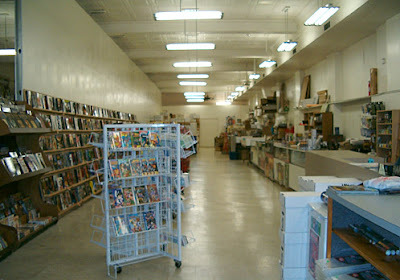 - I enjoy the "event" that is going to the shop, picking up my books, and interacting with the people there. Every time I go on vacation, I find myself looking for a comic shop to visit, not only because I don't want to miss new books, but because I want to sample the atmosphere. Now that I spend a lot of time in North Carolina, I go to Fanboy Comics every so often. When I spent a summer in the state of Washington, I shopped at (and loved) Olympic Cards and Comics. Now that Evil Genius has opened up in my old hometown, I'm sure I'll be hitting them up from time to time. 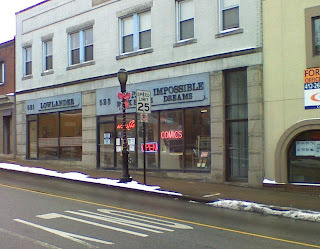 But Impossible Dreams Comics in Bridgeville, Pennsylvania continues to hold my pull list, and I'll keep that list there until I move so far away that I can't possibly make it back in a reasonable amount of time. The shop is pretty small and where others have branched out into gaming and cards, Impossible Dreams is exclusively comics - so you know what you're in for when you go there. Anyone in the Pittsburgh area should check the store out (and pick up a copy of Teddy and the Yeti while you're at it...) on a new comics Wednesday and say hi to Lou, the store owner, and Caleb (or is it Kaleb? ), his dog. I think that everyone should have "their" shop...this one's mine. P.S. This is my 100th post. You're welcome, world at large. Comics tend to have the same advertisements printed over and over and over, month after month, so when something new comes along, it tends to stand out. For the past few months, MDMacro has bought some ad space in, if I'm remembering correctly, both Marvel and DC books. This in itself is nothing new; quite often books from different companies share the same basic ad. What gets strange is when a Marvel book has an ad for Batman toys, or when a DC book has an ad for an X-Men DVD (don't they know the characters belong to their main competitors?? )...but I digress. The ad itself is rather unassuming: it features a guy sitting in front of a building reading a comic book - his hat (Yankees, I guess...whatever) and the comic he's reading is blurred out, and the slogan "Beats for reading comic books to" is pretty much the only text visible besides the website address. I found myself more interested in the advertisement itself than what it was actually promoting, because it was so different than the usual video game or in-house ad. It didn't look like what I was used to; that is, it looked like some guy woke up one morning and said, "what the hell, I'm gonna drop a LOT of money and advertise with Marvel and DC." 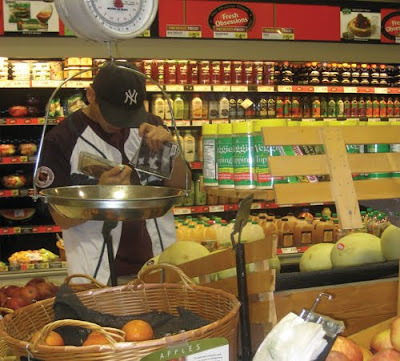 This concept is so odd to me - how much did he end up paying? How could it ever be worth the rates? Do regular people REALLY buy up ad space in Action Comics? I saw the ad the right number of times, apparently, because I finally went to MDMacro's site, and it's...rather sparsely populated from my perspective. I listened to one of the beats...and I guess I could read comic books to them. I just happened to come across a website promoting Indy Comic Book Week, which as it turns out culminated with last Wednesday's new comic book releases. Diamond distributing decided (alliteration!!) to take last week off from shipping comics - that means that no new comics from the bigger companies arrived in stores last week, leaving an opening that a group of independent comic book creators tried to take advantage of by promoting a number of independently created books. It seems to have been a success, in that now that I'm looking for it, it did get a good deal of publicity. What is surprising to me, though, is that I apparently took part in the festivities without even planning on it. Not only was there the signing that took place at Evil Genius Comics, but if you click on Midtown Comics' banner advertisement for ICBW (wait...don't they make root beer? Oh, that's ICB), you'll find 45 comics listed and Teddy and the Yeti #1 is one of them, which is great. Click on the title, and you see the T&Y cover with the Midtown watermark on it, which for me is strangely satisfying. Now, at least, I have a better idea as to why Midtown decided to put such a big order in - I guess that on Wednesday the book was highlighted along with other indy fare. Talk about your blind luck. Maybe next year, if they decide to continue this tradition and especially if it's aided by Diamond taking a week off, I can take part in ICBW 2010...and actually know about it while it's happening. "But Jeff," you ask, "why such a despondent look?" In return, I reply, "Don't use such big words! And we're not really on a first name basis, now are we?" Ah, the magic of fantasy. Where you look up and see a picture of me looking like I'm reconsidering all of my life's goals, I am, in fact, having a great time down at Evil Genius Comics. As I had mentioned a few times, I took a trip down on Wednesday of this week and, with the help of a newspaper article promoting Teddy and the Yeti, I was able to meet a lot of people and sell a whole lot of copies of the first issue. I want to thank the guys at Evil Genius for setting this signing up - it was a great success in a number of ways. From a purely selfish standpoint, I sold more books on Wednesday than I had in any other given day other than when Midtown Comics put in their giant order. From a personal standpoint (and perhaps also a selfish one), I got to interact with a lot of great people, both those that I knew (get in the paper and you see high school friends you haven't seen in years, I guess) and those I didn't before Wednesday. Lots of great conversation and interesting people. Heck, even my barber showed up. My barber! This is the first time I've seen him outside of his shop, and I've been going to the place since I was 13. Unreal. Maybe we'll do it again when issue #2 comes out (next month, kids). College will be back in session and hey, Evil Genius is situated right off campus from Cal U. We'll see what happens.